Photo of SCP-2753-A instance taken during Boston Anomalous Art Expo (BAAE) prior to collapse. Special Containment Procedures: A Foundation-operated bot (I/O-SILVER) is to monitor internet traffic for SCP-2753. Upon discovery, all data containing SCP-2753 is to be destroyed. Anyone outside of Foundation personnel aware of SCP-2753 is to be apprehended, interrogated, and amnesticized. Instances of SCP-2753-A are to be kept disassembled in a secure locker on-site. Instances of SCP-2753-B and SCP-2753-C are to be handled on a case-by-case basis. Tests are prohibited at this time. Description: SCP-2753 is a 3 dimensional ratio that can be used to describe the relationship between the sides of a block. Instances of SCP-2753-A are blocks which match SCP-2753's projection within a certain threshold; they can otherwise be of any size and material. They exhibit their anomalous property only when 42 instances of similar size and material are assembled into a standard Jenga1 tower: If this tower collapses, any structure containing it will immediately collapse with it. Since 2009, the growing popularity and accuracy of 3D printing combined with SCP-2753's presentation within OBJ files2 as a printable Jenga set has led to 21 structural collapses, 35 injuries, and 14 deaths. How High Can High Art Get? Let's Find Out! This tower is to be assembled at the start of the exposition; audience members are encouraged to take turns trying to take art higher and higher! But be warned: High art carries high risk! Reach too high, and you might just find your paradigm comes crashing down right on top of your head! Based on information provided by an undisclosed source, the Foundation-operated bot (I/O-SILVER) was used to search for SCP-2753 projections in financial market data. The collapse of several investment firms and multi-level marketing4 companies were unexpectedly linked to SCP-2753. Further investigation has demonstrated the existence of SCP-2753-B instances. Instances are financial assets that match SCP-2753's projection within a certain threshold; they can otherwise be of any value and type. They exhibit their anomalous property only when 42 instances of similar value and type are assembled into an interdependent network: If this network loses solvency, any corporate entity linked to it will experience an immediate catastrophic financial collapse. Foundation efforts are currently underway to discover all such networks and safely disassemble them. Based on information provided by an undisclosed source, the Foundation-operated bot (I/O-SILVER) was used to search for SCP-2753 projections in various popular code repositories and file-sharing networks. Several significant server crashes along with losses of critical data were linked to SCP-2753. Further investigation has demonstrated the existence of SCP-2753-C instances. Instances are files with specific attributes matching SCP-2753's projection within a certain threshold; they can otherwise be of any size and type. They exhibit their anomalous property only when 42 instances of similar size and type are accessed simultaneously by a single program. If this program crashes unexpectedly, any network running this program will experience an immediate catastrophic failure. Foundation efforts are currently underway to discover all such programs and destroy them. NOTE: The IntSCPFN network has experienced a critical error. If you are seeing this message, please immediately notify your Site-Director via phone, radio, or in person. 1. 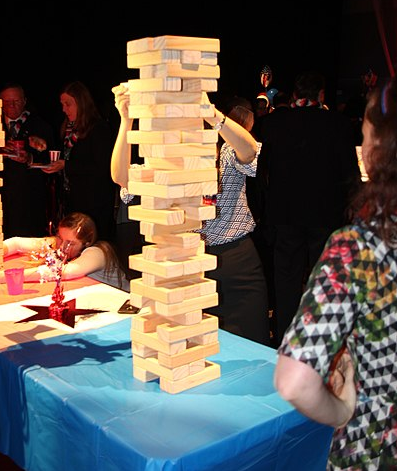 Jenga is a game wherein blocks are assembled into a tower; players then take turns removing blocks and placing them on top while trying to avoid a collapse. 2. OBJ is a geometry definition file format used as instructions for many commercially available 3D printers. 3. The Boston Anomalous Art Expo (BAAE) is an underground art exposition dedicated to sharing works from various anartists. 4. Multi-Level Marketing (MLM) is a business strategy relying primarily on pyramid-shaped commission systems to produce profits.